A new book about Vasco the Soccer Pig will find its way out into the world. In a few months this new picture book with the great and awesome Alain Verster will be published (by De Eenhoorn in Belgium). It's gonna be VASCO AND THE GREEN MONSTER and contains the story of how Vasco one day hoped to play soccer with his human mate Matteo (because they do so every day), but suddenly Matteo says he will be getting a new 'present' to play with - and this present is called John. Vasco's head fills itself with jealousy and fear - will he be replaced by John, the Green Monster? In 2011 Alain Verster debuted with my story THE DOVE THAT COULDN'T DIVE. The book was sold to six countries and received four awards. 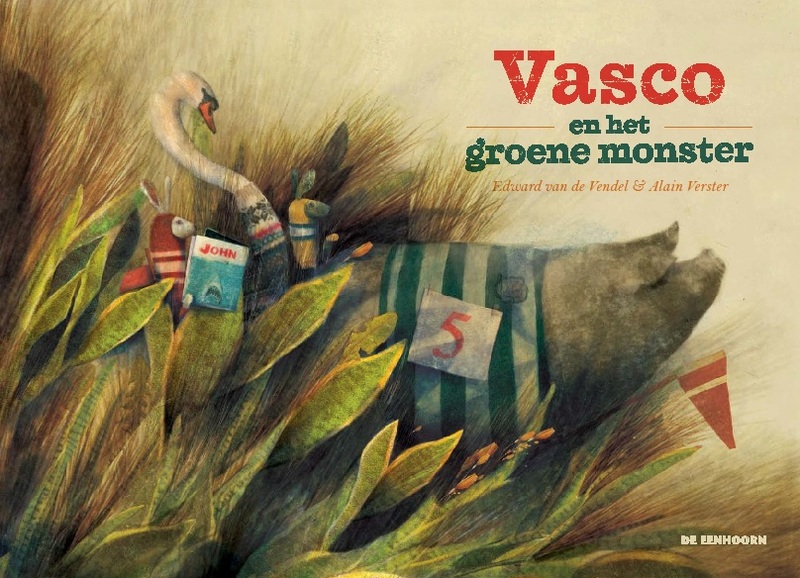 Our second collaboration was the 2013 VASCO THE LITTLE SOCCER PIG, which is also available in Chinese and Brazilian Portuguese and was nominated for the Boekenpauw, the highest Flemish illustration prize. VASCO AND THE GREEN MONSTER, which is to be read separately, is our third book together.